I was delighted recently to be contacted by These Fair Hands, a small, family run business based in Hampshire, selling the most beautifully hand crafted wooden gifts and home-wares. I was asked if I would be interested in reviewing a product for them to feature on my blog, which of course I agreed to do. Looking through the images on their website I was torn between quite a few of their products. I fell in love with their candle holders, they really are gorgeous. But having a home brimming with candles already, I restrained myself with brute force and continued my search of their website. The trouble was that all of their products would fit so well into our little country home. They are all so useful and are easy on the eye too, I could think of a use for near enough all of the products in our home. I especially liked the fact that all of the products could be personalised, it just makes them all that bit more special, whether they be for yourself or for a gift. 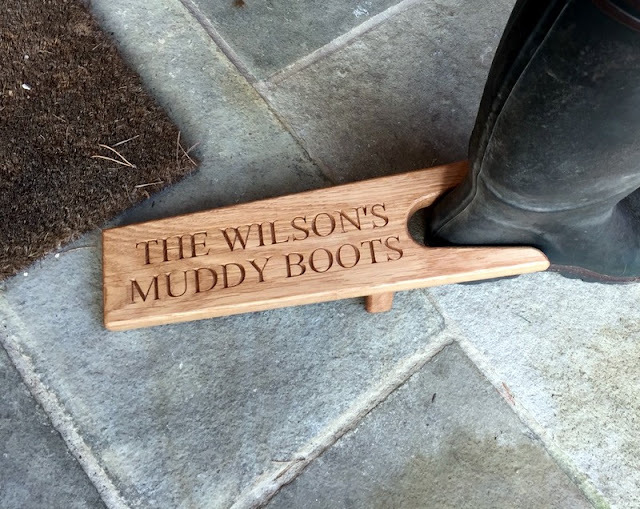 In the end I decided upon the boot jack, something that would come in very handy in our household after those country walks or afternoons spent in the garden. It's always nice receiving happy post and having this delivered was no exception. It was wrapped beautifully complete with a cute little kraft tag. The quality of the product itself is outstanding and to think it has all been handmade here in the UK is just fantastic. I do love seeing great workmanship like this. I just know we will get years and years of use out of this (once I can bring myself to use it, I really don't want to get it dirty). They work to a turn around between you ordering and receiving your product within 2 weeks. To guarantee that your orders are received in time for Christmas you will need to place your order by Saturday 5th December. What are you waiting for? Go and check them out. * This is an honest review of this product, all words are my own. Thanks goes to These Fair Hands for approaching me for this review. Oh! Now I get how to use it! I'm a bit slow here sometimes, Gem!